Ground penetrating radar (GPR) is a non-destructive geophysical method that produces a continuous cross-sectional profile or record of subsurface features, without drilling, probing, or digging. 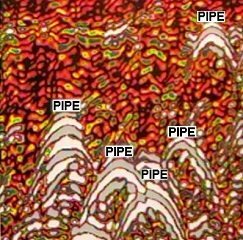 The ground penetrating radar (GPR) cross-section shows the ground surface at the top of the profile, and the reflections of subsurface geologic units and objects to a certain depth at the bottom. 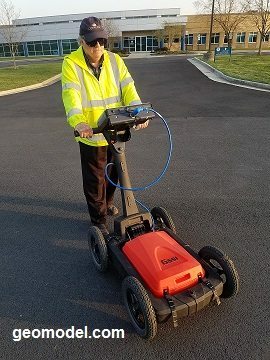 Ground penetrating radar surveys can be conducted using a GPR cart that is pushed along the ground surface, or they can be performed using an ATV or truck mounted configuration. Ground penetrating radar (ground radar) operates by transmitting pulses of ultra high frequency radio waves (microwave electromagnetic energy) down into the ground through a transducer (also called an antenna). The GPR antenna (transducer) is pulled along the ground by hand or behind an ATV or a vehicle. The transmitted energy is reflected from various buried objects or distinct contacts between different earth materials. The antenna then receives the reflected waves and stores them in the digital control unit. The control unit registers the reflections against two-way travel time in nanoseconds and then amplifies the signals. The output signal voltage peaks are plotted on the GPR profile as different color bands by the digital control unit. 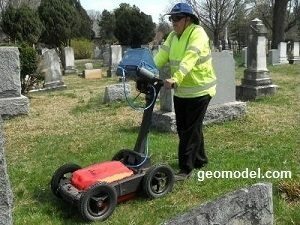 GeoModel, Inc. conducts ground penetrating radar surveys for locating unmarked gravesites and confirming marked gravesites at cemeteries. 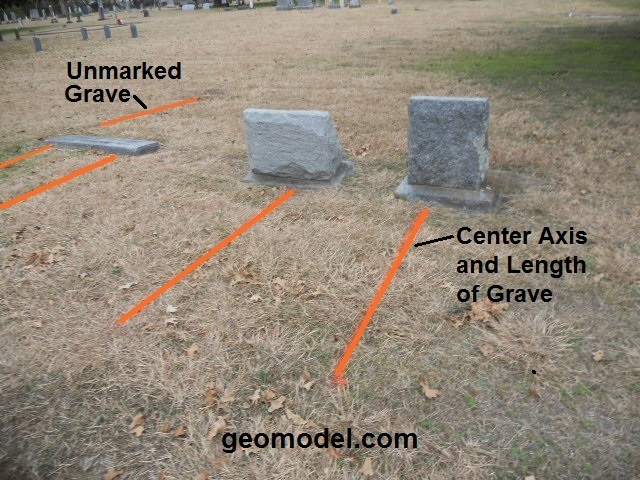 The GPR profile and cross-sectional diagram (below) shows several gravesites (caskets) detected using GPR. The soils at this site were very sandy and the caskets produced distinct anomalies. The GPR image shows that the condition of the graves are very distinct (more recent internments). 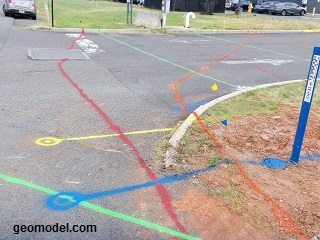 GeoModel, Inc. has been locating utilities and pipelines at sites nationwide using ground penetrating radar (GPR) since 1991. A utility or pipeline made of metal, PVC, or any other material that has different dielectric or conductive properties than the surrounding soils or rocks might be located with GPR. GPR can locate gas, oil, and production pipelines, water lines, sewer lines, electrical duct banks, and large or bundled communication lines. Ground penetrating radar run perpendicular to a buried pipe produces the typical upside-down U-shaped feature in the GPR profile, as seen above. 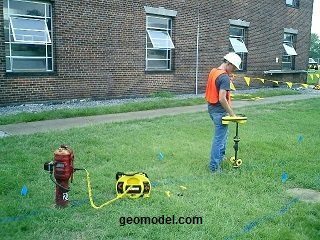 Ground penetrating radar and other GeoModel, Inc. locating equipment can detect some types of underground utilities that other locating companies cannot detect with their equipment. The depth of penetration is also determined by the ground penetrating radar antenna used. GPR antennas with low frequencies of from 100 to 200 MHz obtain subsurface reflections from deeper depths (about 25 to 100 feet or more in low conductivity soil and rock), but have low resolution. These low frequency antennas are used for investigating the geology and bedrock of a site, such as for locating sinkholes or fractures, to delineate deep landfills or trenches (with no clay cap), and to locate large, deeply buried objects. GPR antennas with higher frequencies of from 300 to 1,500 MHz obtain reflections from shallow depths (0 to about 14 feet in low conductivity soil and rock), and have high resolution. These high frequency GPR antennas are used to investigate surface or shallow subsurface soils and to locate small or large, shallow, buried objects, such as utilities, pipelines, unmarked gravesites, archaeological sites, landfill trenches, underground storage tanks (USTs), buried drums, and also rebar in concrete. Ground penetrating radar can find buried objects and other underground features that are reflective for radar waves. 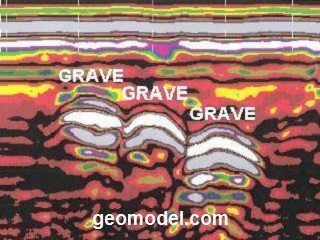 Examples of what GPR can find are underground pipes, grave sites, underground voids, and other buried objects and features. How deep can ground penetrating radar detect? 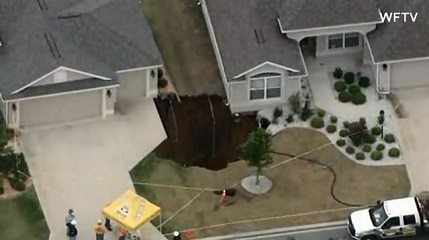 Generally, for most areas of the United States, the depth of investigation is about 10 feet. In areas with clay soils, this depth is only up to a few feet. In areas of sandy soils, this depth can be as much as 30 feet. Can ground penetrating radar detect through concrete? GPR can detect through concrete even if it is reinforced. It can even detect the rebar in the concrete for engineering purposes. Is ground penetrating radar portable? GPR is very portable and is easily moved over each site with just one operator. Ground penetrating radar equipment can even be packed in suitcases and shipped as airline baggage. Is ground penetrating radar easily interpreted? Depending on the objects or features being investigated, with some instruction, GPR data profiles may easily be interpreted, or may require years of experience to interpret. 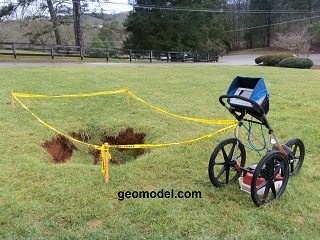 GeoModel, Inc. conducts ground penetrating radar surveys using a SIR-3000 digital control unit and various antennas with frequencies ranging from 100 to 1,500 MHz. 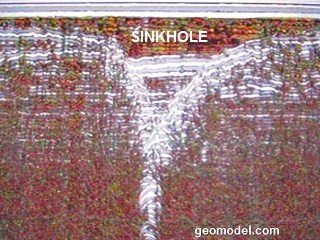 The GeoModel, Inc. principals have over 50 years of combined experience and conduct GPR surveys nationwide.